In my capacity as Operations Director at Moore Legal Technology I’ve been speaking to various family lawyers recently about all things online business. One discussion that came up recently was getting trainee/junior family law solicitors to do background research on the social media activities/profiles of partners of clients, particularly where it’s the partner of a client about to proceed with a divorce. 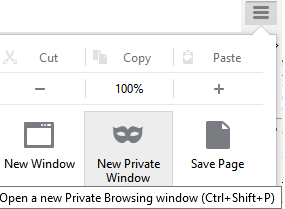 To start InPrivate Browsing in Internet Explorer, click Settings > Safety > InPrivate Browsing. There’s also a keyboard shortcut (Ctrl+Shift+P) to launch it. Alternatively, right-click on the Internet Explorer taskbar icon and choose Start InPrivate Browsing. Also you can right-click on the Firefox taskbar icon and choose New private window. 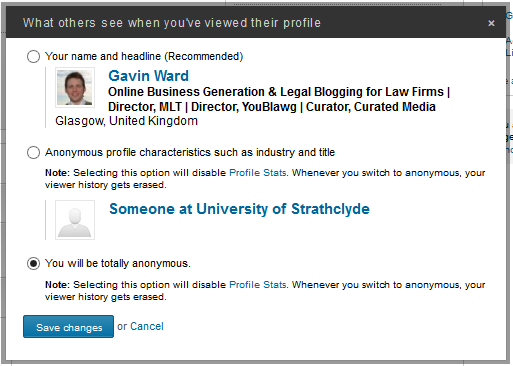 Within LinkedIn itself to change your privacy settings so that the person can’t see who you are. To do so you can click your avatar at the top right, choose ‘Privacy & Settings’, click Select what others see when you’ve viewed their profile, then click ‘You will be totally anonymous’ and save. BUT if you do this, bear in mind that for the purpose of business development and networking, your professional profile won’t show up to other professionals when browsing their profiles, which can always be a useful way of keeping you top-of-mind. While these options exist within LinkedIn, to be absolutely safe, private browsing and/or logging out of LinkedIn is the best approach. 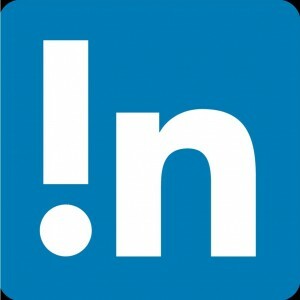 This may well be common sense to many, but there’s a real risk that some of your family lawyers may not be tech-savvy enough to avoid embarrassment and professional reputation damage when searching within LinkedIn and showing up as having viewed a client’s spouse’s profile. So, from a professional practice perspective, get your and your colleagues’ private browsing switched on. If you think there are more tech challenges that lawyers really need to overcome / be fully aware of from a professional practice point of view please do get in touch here, in the comments, or on Twitter. PS for the observant readers amongst you I hope you like the LinkedIn logo mark re-working!